These Winnie-the-Pooh quotes come from the famous books for children written by English author A A Milne. Alan Alexander Milne was born in 1882 and died in 1956. He wrote stories, plays and poetry for children and adults but is most famous for the four books he wrote for children about his son, Christopher Robin, and Christopher's collection of toys. The model for Winnie-the-Pooh was actually a bear called Edward which Christopher Robin received as a first-birthday gift. 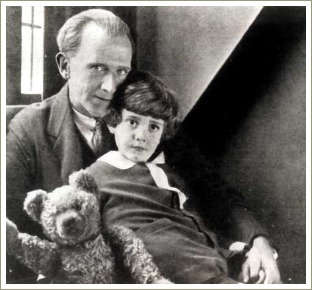 As a child, Christopher carried the bear everywhere with him which gave his father the inspiration for the Winnie-the-Pooh character. A A Milne had a fantastic way with language and his poems and stories contain some lovely thoughts expressed in unusual and often thought-provoking ways. 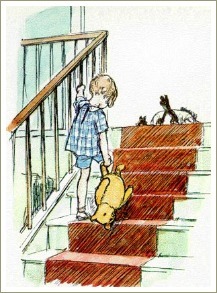 You may notice that this page has fewer quotes than most of the other Winnie-the-Pooh quotes pages on the web. This is because I've only included the quotes I like exactly as they appear in the books. There's a cute little book around called Pooh's Little Instruction Book. This is inspired by A A Milne's books and includes some of the events and words which appear in the four books Milne wrote massaged into words of wisdom to fit the idea of an instruction book. The book's fun but it wasn't written by A A Milne and the words are not the ones that appear in the original books so I haven't included them on this page. "A bear, however hard he tries, grows tubby without exercise." " ... it's always useful to know where a friend-and-relation is, whether you want him or whether you don't." " ... so that's why he likes having it told to him again. Because then it's a real story and not just a remembering." "I did know once, only I've sort of forgotten." " ... however big Tigger seemed to be, he wanted as much kindness as Roo." " ... my spelling is Wobbly. It's good spelling but it Wobbles, and the letters get in the wrong places." "And it was eleven o'clock. Which was Time-for-a-little-something ... "
"Poetry and Hums aren't things which you get, they're things which get you. And all you can do is go where they can find you." " ... he thought that if he stood on the bottom rail of the bridge, and leant over, and watched the river slipping slowly away beneath him, then he would suddenly know everything that there was to be known ..."
"Pooh looked at his two paws. He knew that one of them was the right, and he knew that when you had decided which one of them was the right, then the other one was the left, but he never could remember how to begin." "Well," said Pooh, "what I like best - " and then he had to stop and think. Because although Eating Honey was a very good thing to do, there was a moment just before you began to eat it which was better than when you were, but he didn't know what it was called." 'Well, not so much. They won't let you.'" "You've never been to see any of us. You just stay here in this one corner of the Forest waiting for the others to come to you. Why don't you go tothem sometimes?" "Pooh knew what he meant, but, being a Bear of Very Little Brain, couldn't think of the words." "I have been Foolish and Deluded." 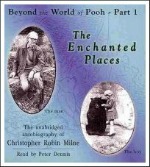 Christopher Robin Milne died in 1996. He and his wife had one child, Clare. Christopher's autobiography covers several books but the most fascinating one is the first one which covers his childhood. The book's called The Enchanted Places and, although it's out of print, it is available as an audio book from the Book Depository. It's a fascinating story so it's worth keeping an eye out for a second-hand copy of the book. I have a 1973 copy which I bought on ebay.